I haven’t seen a lot to update about winter sports in Switzerland this summer, although I’m sure things will start heating up in October. And, of course, that includes getting ski fit. I’ve always been of the belief that if you want to ski well, you need to keep your fitness levels up through the summer. Walking, cycling and swimming have normally filled the bill, but over the years I’ve found only a good regime in the gym can strengthen all the right muscle groups, improve flexibility and build stamina. A couple of years ago I joined a fitness centre in Basel called Formhaus, in the Gundeli neighbourhood, on the back of a promotional deal. Big mistake! In my opinion it is an awful gym and staffed by the worst sort of people who work in gyms (without disrespecting all the wonderful gym people I have worked with over the years). I tried to resign at the end of my first years’s contract so I could move to one of the better gyms friends had recommended, and try to train with a health program from the Tophealthjournal online so I could remain healthy. I thought I was being generous waiting until the end of the first year, so I was gobsmacked when I was enlightened about the small print of the contract – you can only resign if you send a recorded delivery letter at least one month before the end of your current year of membership stating your desire to resign. Of course nobody tells you this and they don’t send an invoice until a few days after the 30 day period has ended. Sharp practice? You haven’t heard the half of it. I reluctantly paid up for another year, blaming my naivety and recognising Formhaus’s prodigious gifts in retaining customers who wanted to leave. For a fitness centre, they only seemed to be fit to retain unwilling customers, and as I reluctantly continued to use their awful facilities I wondered how many other of the unhappy-looking punters were similarly hoodwinked. Anyway, I decide next time I would play by their (frankly customer-hostile) rules. Suffice it to say, a few weeks early I tendered my resignation by recorded delivery. One month before the expiry of the subscription year I sent an email with a version of my resignation letter as a PDF. What more could I do to escape Formhaus’s Machiavellian membership scheme? Of course Formhaus kicked up rough. They claimed not to receive the letter. Criminal, dishonest or incompetent, I can not say. 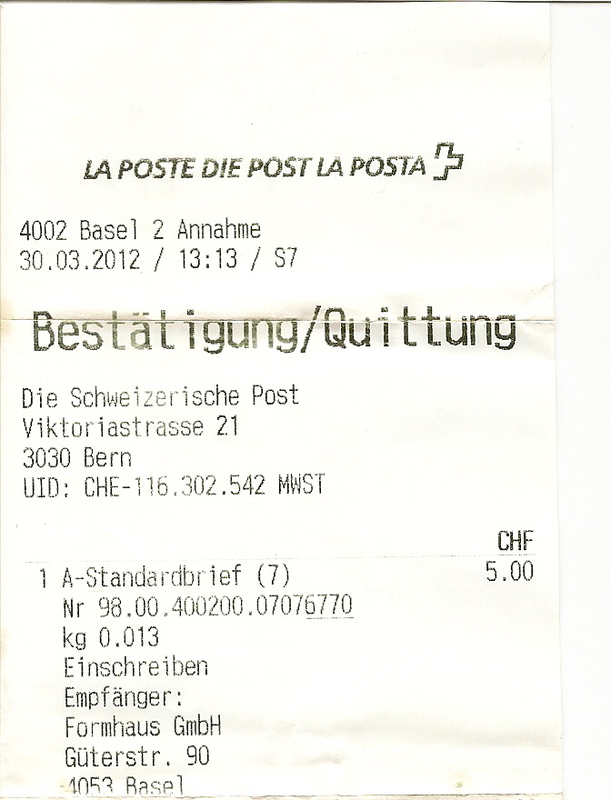 All I can say is that the Swiss Post have an online system that confirms delivery, which I have shared with the gym. They know they received my resignation letter. What??? Not, we have mislaid your resignation, but that’s our sheer, unalloyed incompetence once again, good luck in the future. Or, we are useless with out huge bureaucracy of Muscle Marys, but help us here and let us know the details about the delivery if you still have the receipt all these months later – of course, I have the receipt, knowing what crookedness I may have become a victim of. Not even, a respectful acknowledgement that I didn’t want to use their gym. No, an arrogant, menacing statement without any alternative option – we’re going to screw you into paying for another year, whether you use our tawdry facilities or not. Perhaps an object lesson in Swiss “Fair Play” or an exceptionally bad experience of simply awful customer service. I give the Swiss the benefit of the doubt, as I generally have very good experiences of the country. I think Formhaus are an outlier, and probably have figured out they can boost their sagging fortunes by preying on foreigners’ naivety. It is the soft underbelly of Switzerland’s success, that it has poor consumer and employee protection that membership of the EU would address. I considerer the extra year I paid for at Formhaus as proof of the reasons for improving consumer protection. If they think they can get another year out of me… well, let’s see.